I told some people at work today that I had a court hearing this morning at 9:00, which was true, but what I forgot to mention was that I was able to appear telephonically, which means that I could attend this wearing a t-shirt that I legit slept in. So when I had to run to a meeting literally 5 minutes after it ended, there was general confusion about my choices. And so I tried to explain to them that I attended the hearing telephonically "so that's why I'm still wearing the t-shirt I slept in last night." And then I remembered that actually I have worn a t-shirt to real court because it was an emergency once, but by the time I was finished explaining this, everyone was still focusing on the fact that I slept in the shirt I was still wearing and that I didn't bother to change out of it, regardless of whether or not I needed to go to court. So I made a very responsible choice and did NOT inform them that I had actually slept in this t-shirt for two nights in a row. So maybe don't take anything I have to say today seriously. Skylar helped Mr. Doodle get his first puppuccinno from Starbucks. Mr. Pants and his friend Lucky tried to run away from Mr. Doodle, but then their parents told them they had to include Mr. Doodle or come inside. Mr. Doodle helping Skylar work. Emma came to visit. And Mr. Pants could not have been happier about it. Mr. Doodle picks the most awkward snuggle positions. My first Survivor recap of the season. I don't want to brag, but Meg has called it, "were you drunk when you wrote this?" So, yeah. You should check it out. 99-year-old upsets 92-year-old in thrilling sprint. Thanks, Brad. George W. on Michelle Obama at a time when it feels not to have people not fighting. Thanks, Jacob. Photographer edits out people's smart phones. Thanks, Shawn. Former Westboro Baptist Church member explains how persuasive and earnest conversation was able to reach her. Chicken attack. I don't even know. Thanks, Janel. 50 bits of life advice. These things are usually annoying to me, but I like this one. Thanks, Michael. Please join us on the Facebooks and come find me and Mr. Doodle on Instagram at eliwmccann and mr_duncan_doodle. Your Survivor post this week is one of the funniest things I've read in a long time. I will never stop wanting to see pictures of Mr. Doodle. 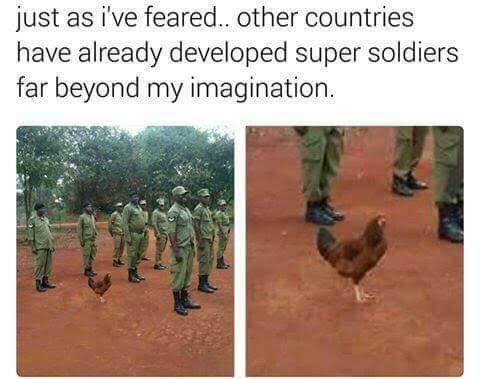 I need to go to bed because I am CRY-LAUGHING at the chicken soldier picture.